Get in guys, we’re going star gazing. And the stars lie not in the sky above, but rather right here on our wrists. Three words: moon phase watches. The watches that may appear as bearing a moon image within their dial. The watches that seem to incorporate the movement of the lunar calendar for no apparent reason. And the watches that, if you knew nothing of them, don’t typically attract much appeal. It’s understandable. You may not be a werewolf and it may not strike you as wildly important to know about the phases of the moon, yet anyone who has ever worn one will tell you that it’s certainly a dreamy (dare we say ‘out-of-this-world’?) way to approach the passing of time. After all, moon phase watches combine an artful display with some seriously incredible mechanics. They’re not only a graphical representation of what is happening in the sky above, but also celebrate a grand technological feat to fit the 29 days (and 12 hours, 44 minutes, and 2.9 seconds) of the lunar month within a 24-hour rhythm of time. Before we get too deep into the rocket science of it, we’ve taken our pick of the best of the horological skies to bring you a list of our current moon phase watch favourites. Bringing a timeless romance that charmingly links us to our moon-watching ancestors of the past, we love these – allow us one last astronomy pun – to the moon and back. Beginning our journey to the moon is this beautifully classic A. Lange & Söhne Grand Lange 1 Moon Phase watch, eponymous of the complication it bears right at its heart. The off-centre main dial shows the hour and minute circle as the home for the moon phase complication, which reproduces the synodic month in 29 days – albeit in slow increments – extremely realistically. The rich blue colour of the nocturnal sky lies in a charming contrast to the solid silver dial and pink gold case, and in combination with the outsize date display and German Auf/Ab (Up/Down) power reserve indicator, makes for a watch that is sophisticated – with a sleepily dreamy touch. 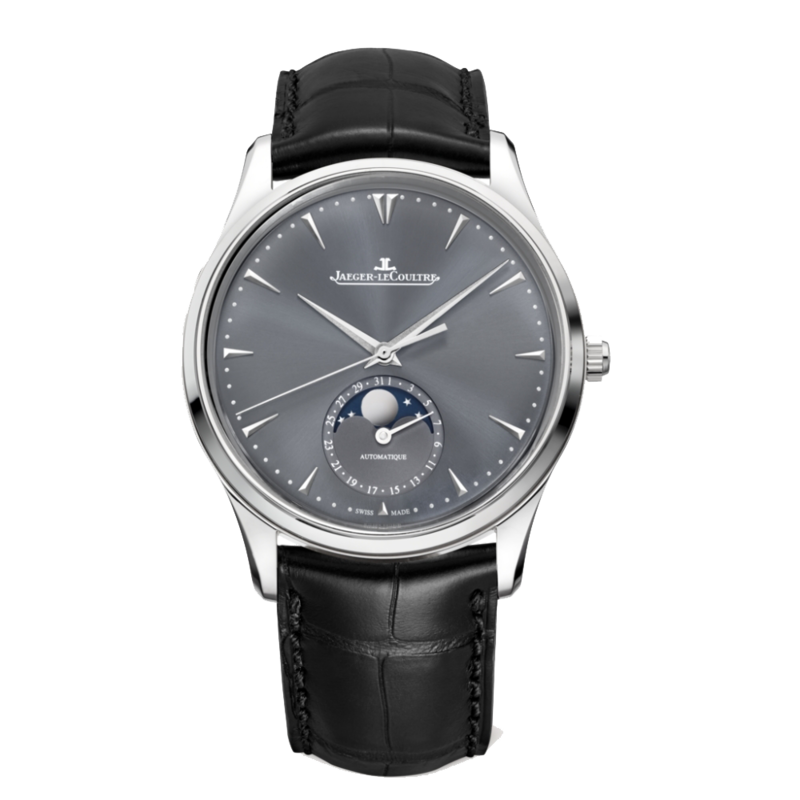 Like fifty shades of space grey, this Jaeger-LeCoultre Master Ultra Thin Moon White Gold 39mm watch (approx. THB 617, 955) bears an unusual colour for a moon phase watch, portraying a discreet moon phase function within its sleek selenite-grey coloured dial. Delicate and refined, the timepiece is ideal for those who wish to admire the nocturnal movements without much of the fuss of further complications. Jaeger-LeCoultre’s signature dauphines move around the dial, gracing over the moon phase at 6 o’clock, and over rhodium-plated hour markers, within a charming white gold case. A discreet sprinkle of star dust for the wrist. 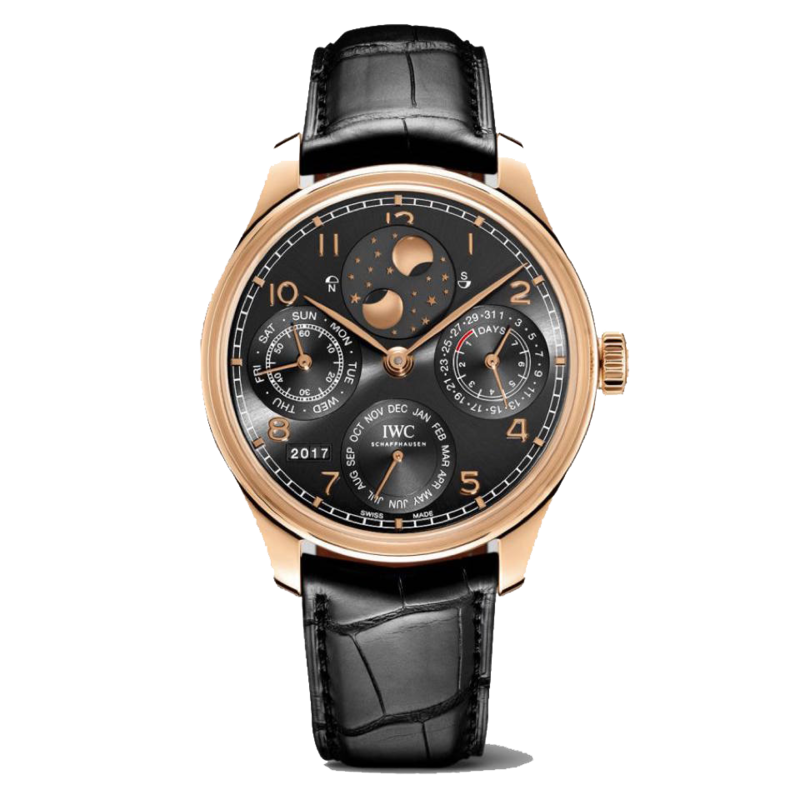 A moon phase watch is most commonly at home within a perpetual calendar timepiece, and this IWC Schaffhausen Portugieser Perpetual Calendar watch (approx. THB 1,403,850) is elegant proof thereof. The 44.2mm timepiece bears an 18ct red gold case, and displays date, day, month, year, and moon phases for both the northern and southern hemisphere. The double moon display comes with the Portugieser’s signature railway-track-style chapter ring, redesigned to accommodate a star-studded night sky. Between a contrast of red gold numerals and a dark slate-coloured dial, it’s a strong timepiece that keeps its wearer well in the loop every step of the way. 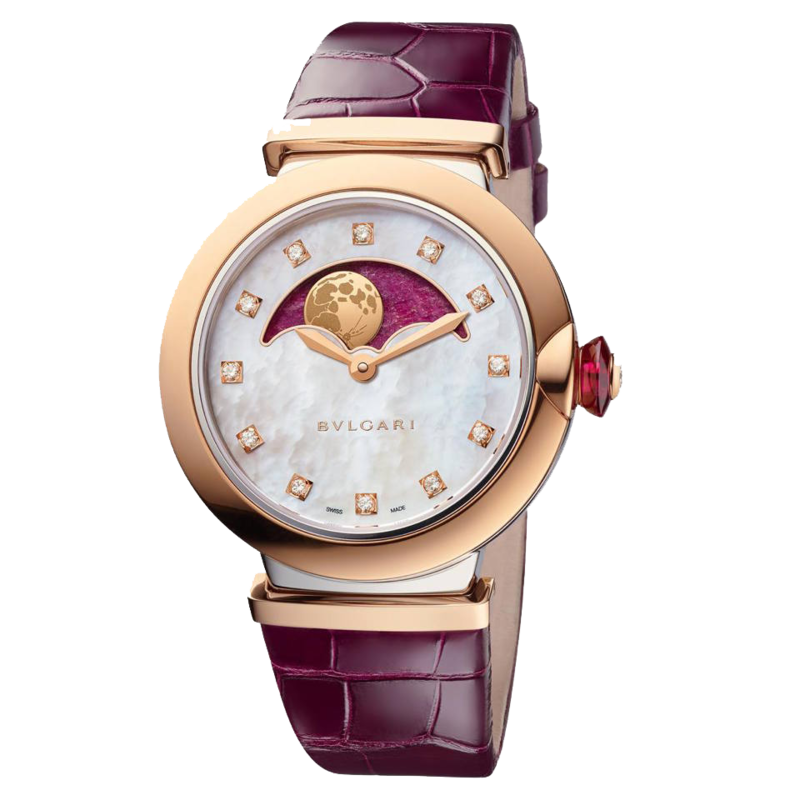 For a glimmer of the stars, the Bulgari LVCEA Watch (THB 558,000) offers a simple yet sparkling take on the moon phase watch. The 36mm timepiece comes with an 18kt rose gold bezel and a mother-of-pearl dial on a purple alligator bracelet. The moon phase is displayed within a heart of ruby dial, and pays tribute to the link between light and time through its sundial-like inspiration. As the gemstone cherry on the top, the rose gold crown is set with a pink cabochon-cut stone and diamond, the unmistakable trademark of the Roman jeweller. An elegant option for the elegant lady who loves a refined marriage of jewellery, horology, and astronomy. 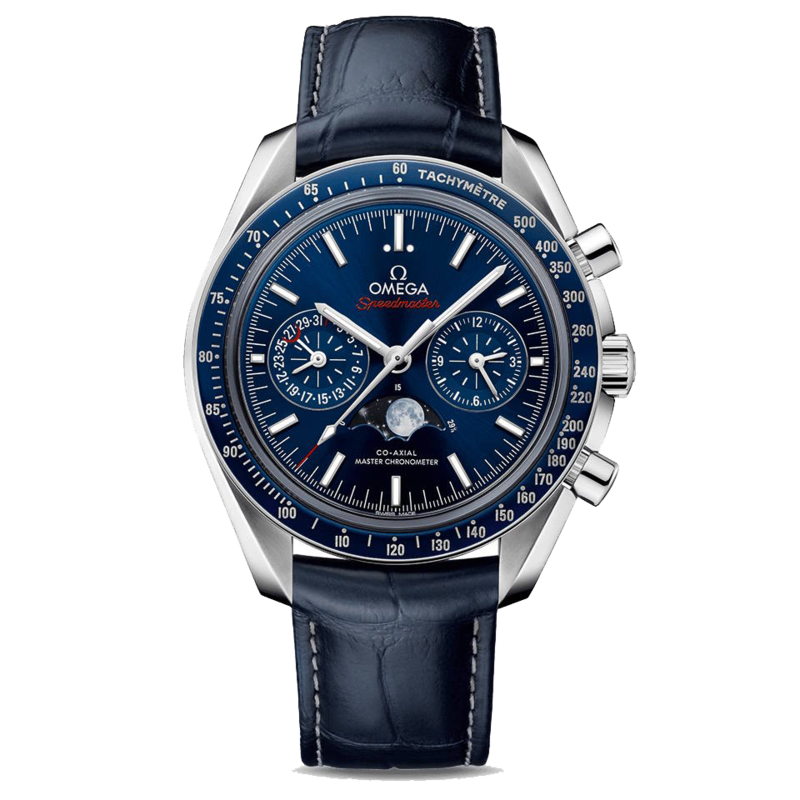 Did you know that the OMEGA Speedmaster was the first watch to ever be worn on the moon? For a timepiece that is sure to make you starry-eyed, the OMEGA Co-Axial Master Chronometer Moonphase Chronograph (THB 353,000) is one of the Swiss watchmaker’s most iconic watches. And whilst its striking deep blue colour is sure to capture eyes at first, its – for lack of a better word – shining star is definitely the micro-structured crystal disc displaying a high resolution image of the moon. Infinitely small and yet photo-realistic and highly accurate, the moon phase complication sits gorgeously within the blue ceramic bezel ring of the 44.25mm case, and if you look extremely closely, you’ll even see an astronaut’s footprint on the displayed moon. 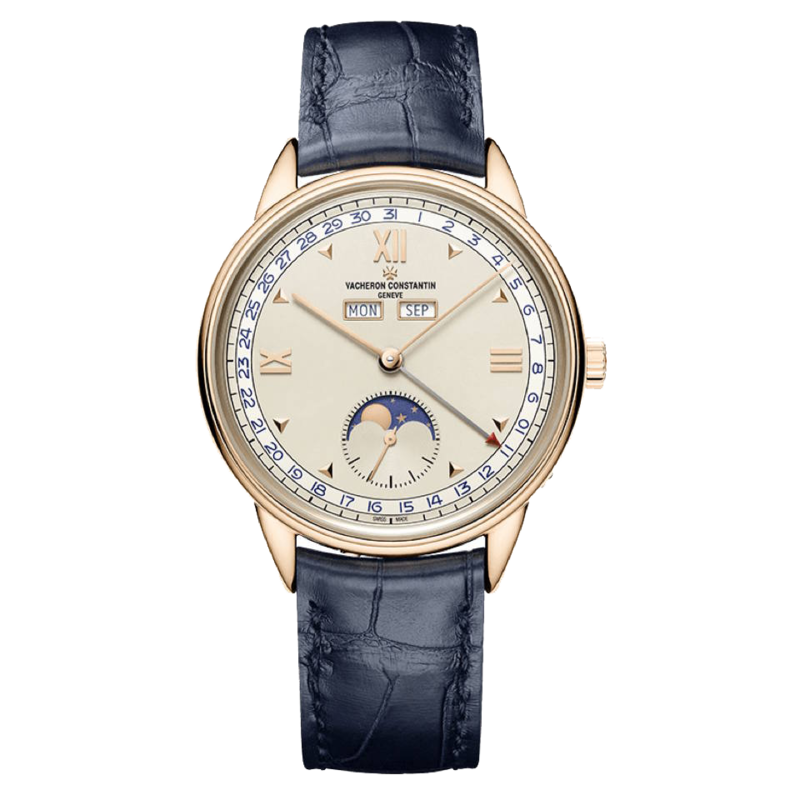 Cutting back to more classic moon phase styles, our list wouldn’t be complete without a piece by Vacheron Constantin. The Historiques Triple Calendrier 1948 (THB 1,250,000) is one of the Swiss watchmaker’s novelties this year, and the vintage-inspired limited edition 40mm watch offers a clean interplay of combinations. For one, various different appliques are at home on the metal dial, as well as a complete calendar display. Albeit somewhat discreet, the day and month are shown on the main dial, with the date indicated by a red pointer. The moon phase indicator sits at 6 o’clock and is housed within a further sub-dial, and yet, the watch appears uncomplicated, sophisticated, and easy to read. Combining a stellar diamond radiance with movement and moon phase, the Piaget Limelight Stella Watch (THB 8,850,000) blends together Haute Horlogerie with Haute Joaillerie in a timepiece that lavishly invites its wearer to admire the skies and almost forget the time. The 39mm watch comes with an 18K white gold case set with 249 brilliant-cut diamonds and 62 baguette-cut diamonds. The dial is set with 15 brilliant-cut diamonds and 15 baguette-cut diamonds, with a delicate grey moon phase indicator at its centre. Featuring a rounded and harmonious curve and a light grey hue, it’s a timepiece that is suited both to glamorous events and glammed-up everyday wear. The sky’s the limit. 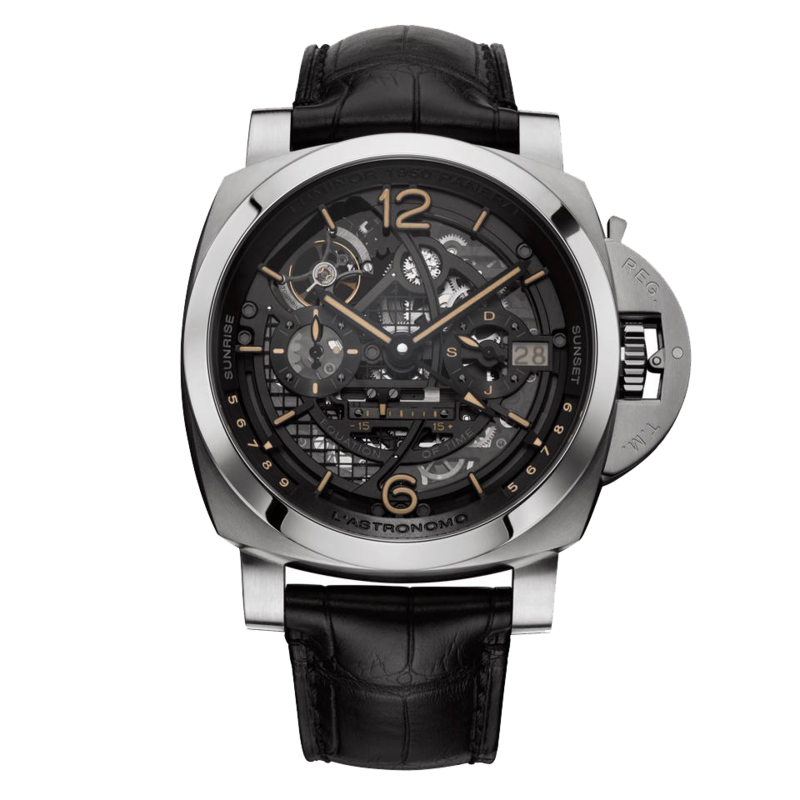 The very first of Officine Panerai’s creations to have a moon phase indication, the Panerai L’Astronomo Luminor 1950 Tourbillon Moon Phases Equation of Time GMT was inspired by Galileo Galilei’s revolutionary moon discoveries. 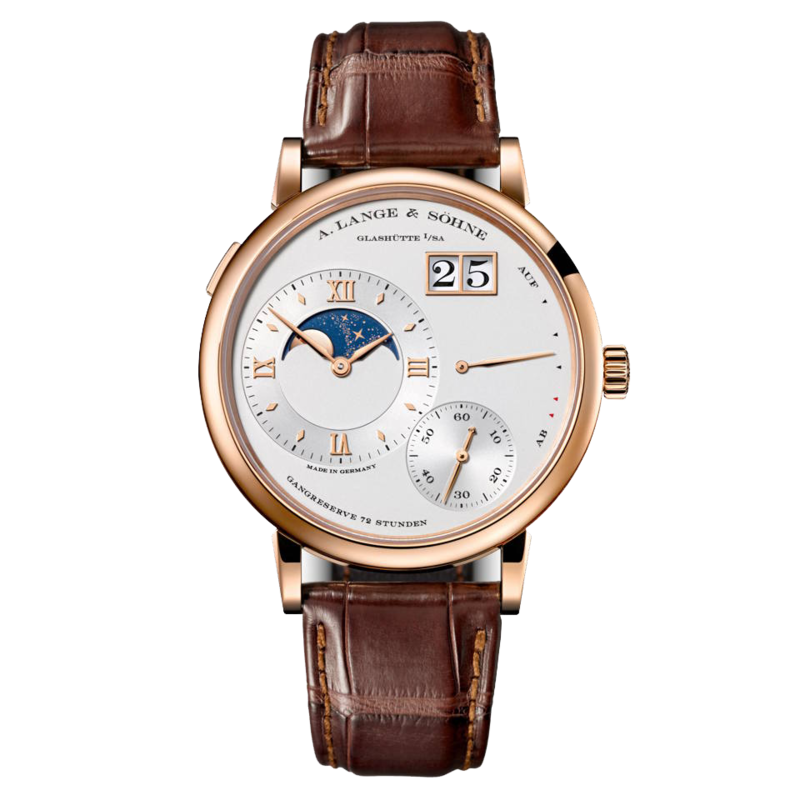 The timepiece features a day/night indicator and moon phase complication on its back (pictured), as well as an innovative system that uses polarised crystal to indicate the date. Using a system of two discs (which display the sun and the moon respectively), the interplay of rotation and shapes is revealed through a highly technical mechanism. Based on a latitude and longitude specified by its wearer beforehand, the watch also displays sunset and sunrise using special 3D cams software. Houston, we have a problem. This is incredibly cool.